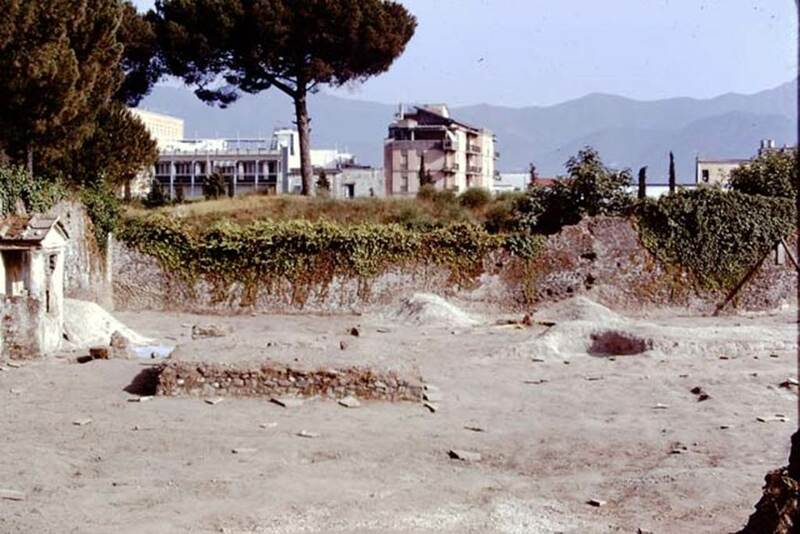 According to Wilhelmina, her first objective in the 1973 summer work season was to finish the excavations in the garden of Hercules. 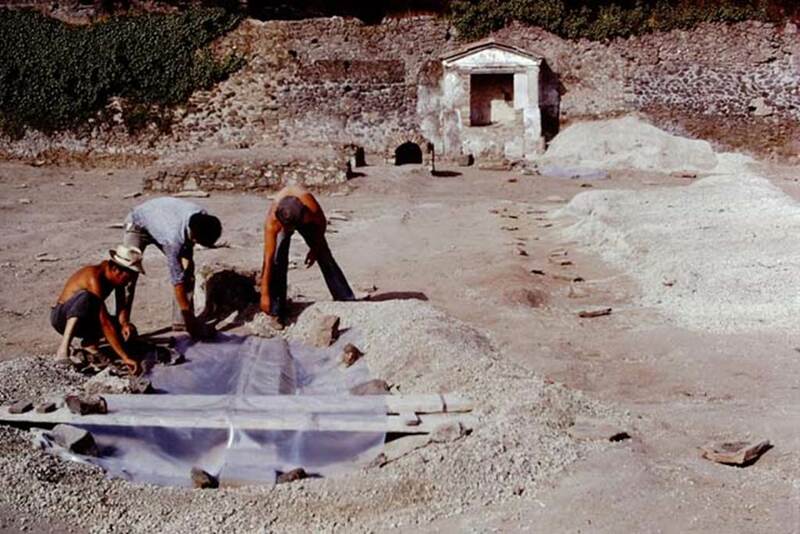 As they continued their work in the garden of Hercules, they removed the rest of the large pile of original lapilli under which the previous year, they had found the zappa (hoe) and the martellina (pick). The unique soil contours here were in mint condition. They found evidence of other beds, as they cleared the garden. The garden had been laid out in wide beds which had been separated by water channels. Rain water from the roof was collected into a dolium on either side of the doorway and also into a nearby pool. 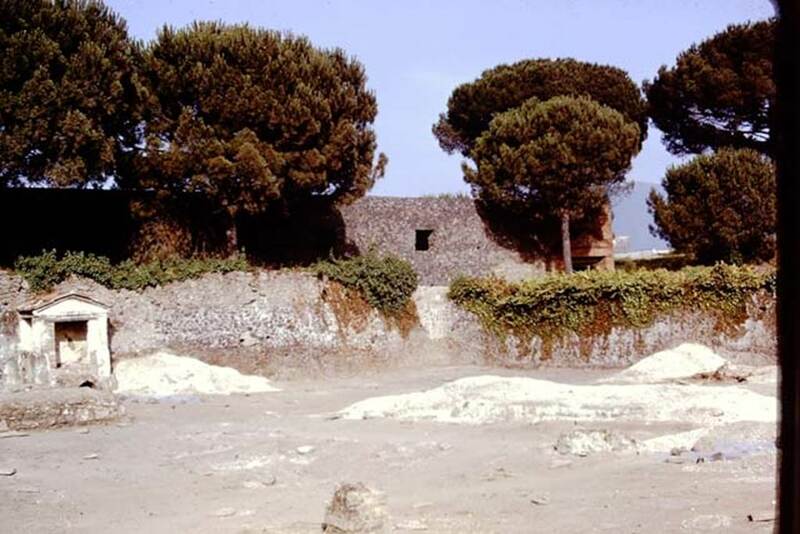 Additional water, which would have had to be carried to the garden, was poured from the street side through an amphora tip (with end broken off) inserted in the east end of the north wall, to fill the dolium embedded in the north-east corner of the garden. When the dolium overflowed, the water continued to flow in the channel along the east wall, and eventually along the south wall. 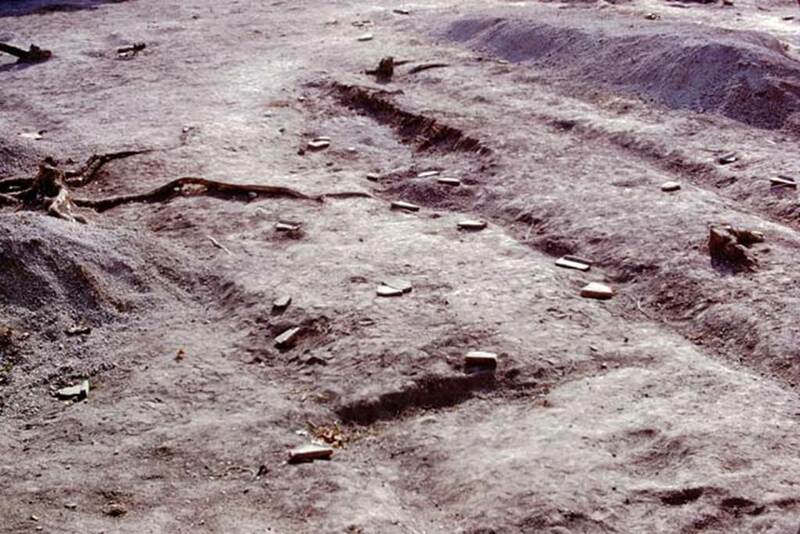 According to Wilhelmina, there were also channels found along the north and south walls. Wilhelmina asked the question – What was grown in the garden of Hercules? She answered by saying the postholes around the triclinium were those of an arboured pergola, the root cavities were those of grape vines to give shade. A few tree-root cavities were found, mostly in the water-channels. Three larger tree-root cavities were found along the walls, seven in the garden, plus a number of smaller ones. 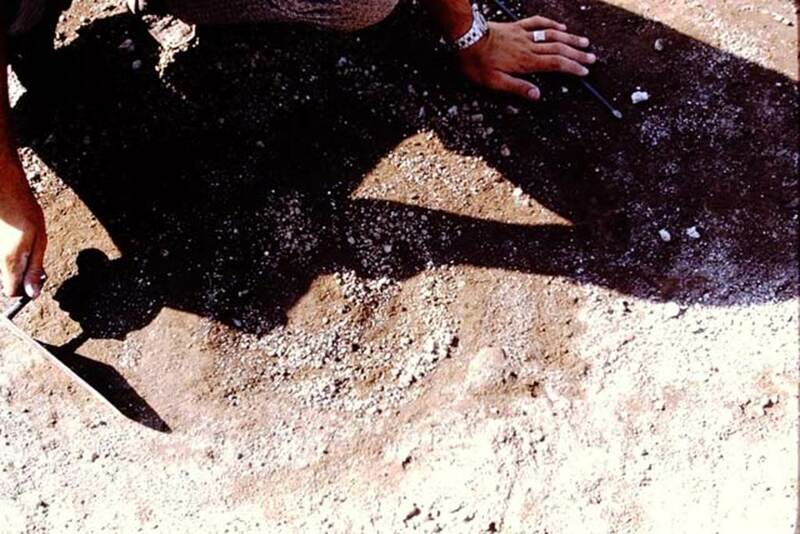 The largest near the cistern was identified as having the shape and size of a very old olive root. 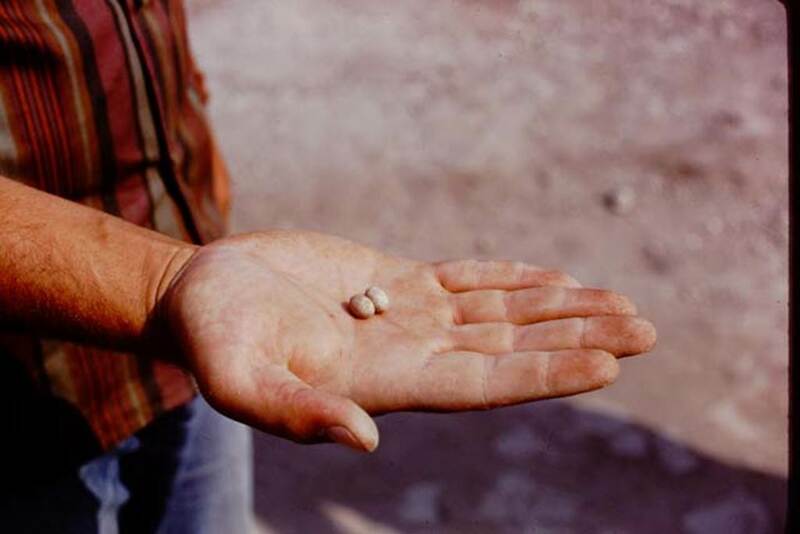 The small carbonized fruit found near the altar, were later identified as cherries, and most likely this could have been another of the trees found. In the tree-root cavities along the walls, terracotta pots were found (8 almost complete and fragments of 2 others) which were similar to those found in the garden of the House of the Ship Europa. One pot was left in the soil so as not to destroy a root cavity. When this was examined, it had the appearance of a lemon tree root. The careful provision for watering these beds make it clear that one of two things were grown here, flowers of vegetables, perhaps some of both. Pompeii was famous for its flower culture in antiquity, as it is today. Perhaps the flowers were grown for perfume or ointments. 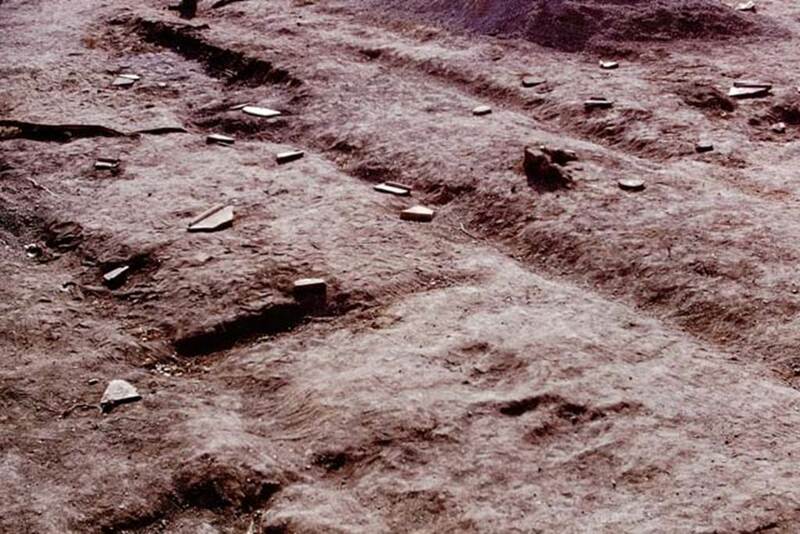 Many glass bottles were found in the house and many fragments of glass perfume bottles and terracotta unguent containers in the garden. 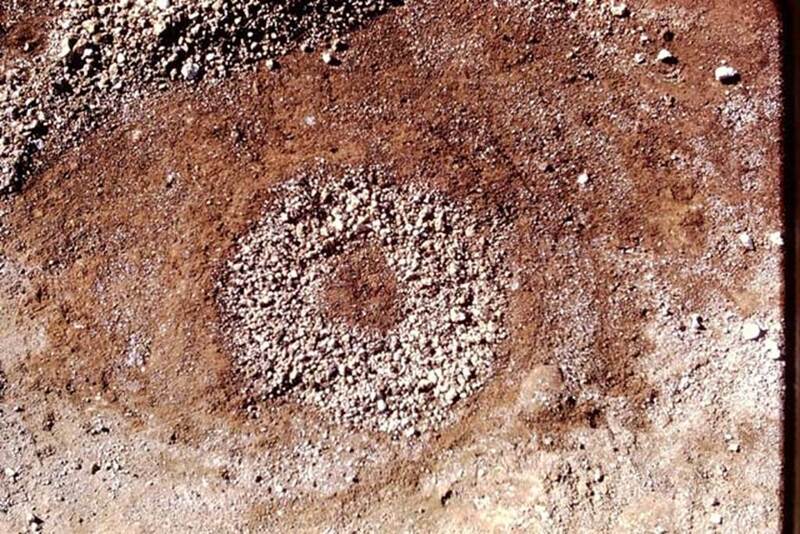 Olive oil was an important base used in making perfumes and unguents ; this could have been supplied by the large olive tree. Wilhelmina tried in vain to locate the mosaic that Della Corte reported finding on the threshold where it would be encountered by customers entering the house. Spelled out in small white tesserae were the words CRAS CREDO which can be translated as the cryptic warning « I will give credit tomorrow ». Many lines scratched on the columns and walls of the atrium were apparently the accounts of the proprietor, which are frequently found at Pompeii. II.8.6 Pompeii, 1973. Looking east along south side of site. Photo by Stanley A. Jashemski. 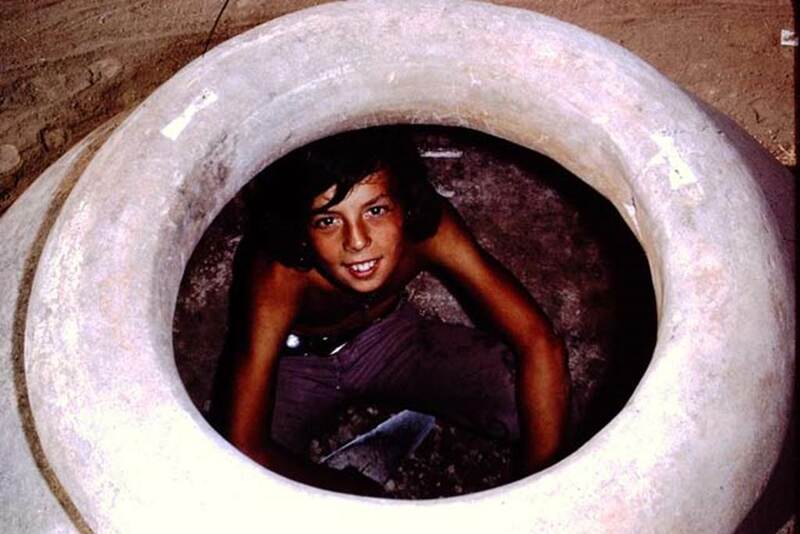 II.8.6 Pompeii, 1973. Clearing around the tree root near south end of site. Photo by Stanley A. Jashemski. 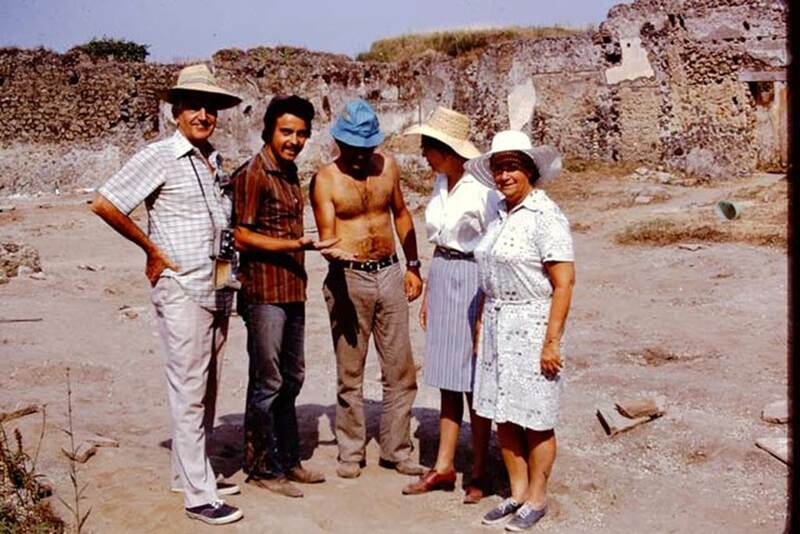 II.8.6 Pompeii, 1973. South-east corner. Photo by Stanley A. Jashemski. II.8.6 Pompeii, 1973. Looking north-west. Photo by Stanley A. Jashemski. II.8.6 Pompeii, 1973. Finds from the soil. Photo by Stanley A. Jashemski. II.8.6 Pompeii, 1973. Digging out a large root cavity. Photo by Stanley A. Jashemski. II.8.6 Pompeii, 1973. Discussion between Wilhelmina and Sig. 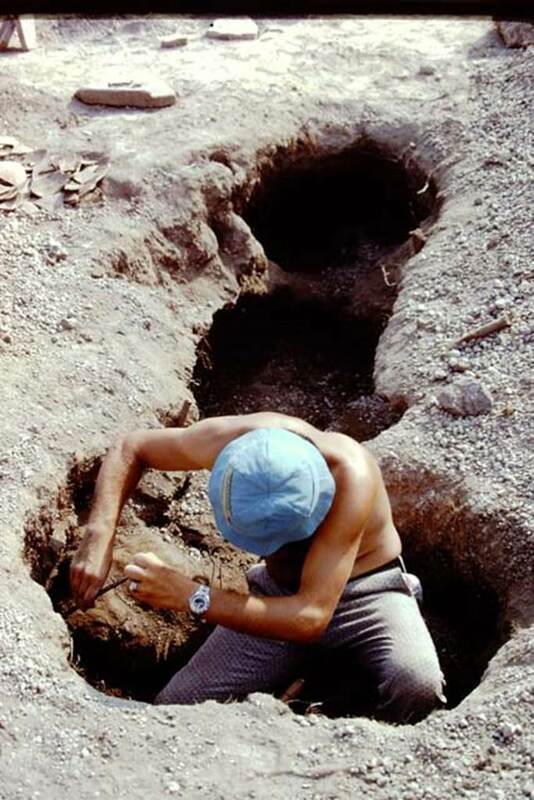 Sicignano over the expanding root cavity. 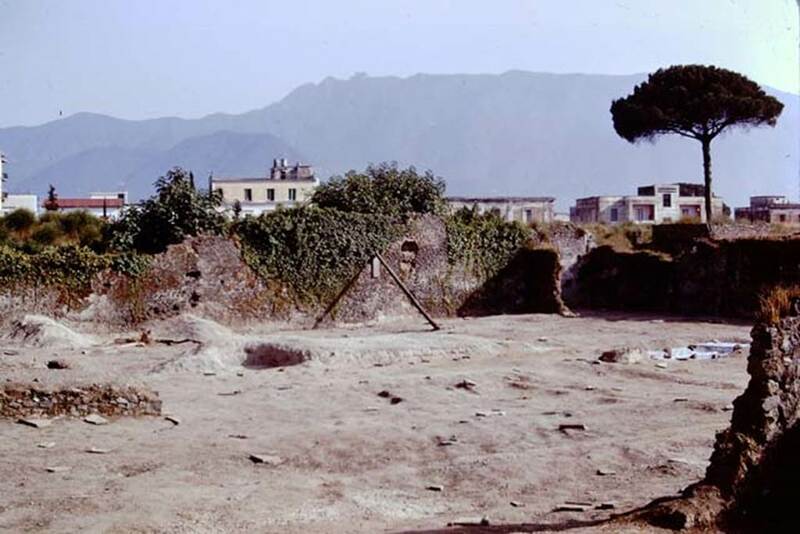 II.8.6 Pompeii, 1973. Root cavity. Photo by Stanley A. Jashemski. 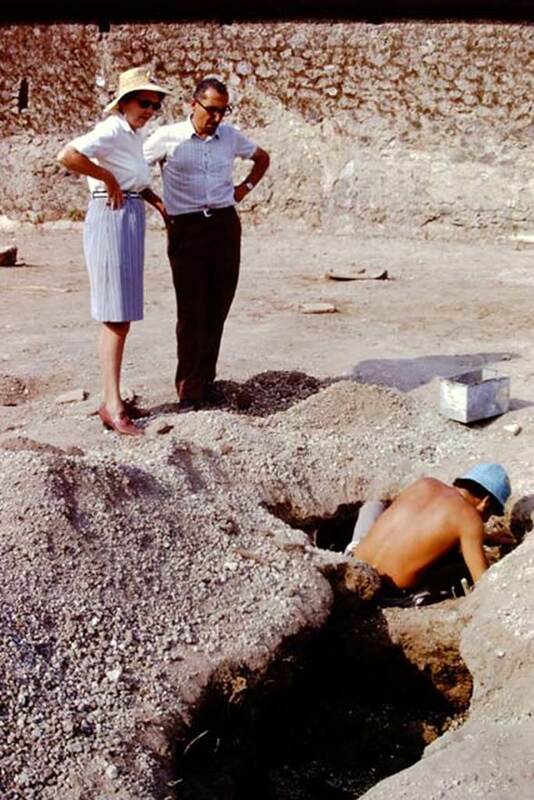 II.8.6 Pompeii, 1973. Measuring and recording the large root cavity. Photo by Stanley A. Jashemski. II.8.6 Pompeii, 1973. Large root cavity. Photo by Stanley A. Jashemski. II.8.6 Pompeii, 1973. Root cavities protected by stones. Photo by Stanley A. Jashemski. 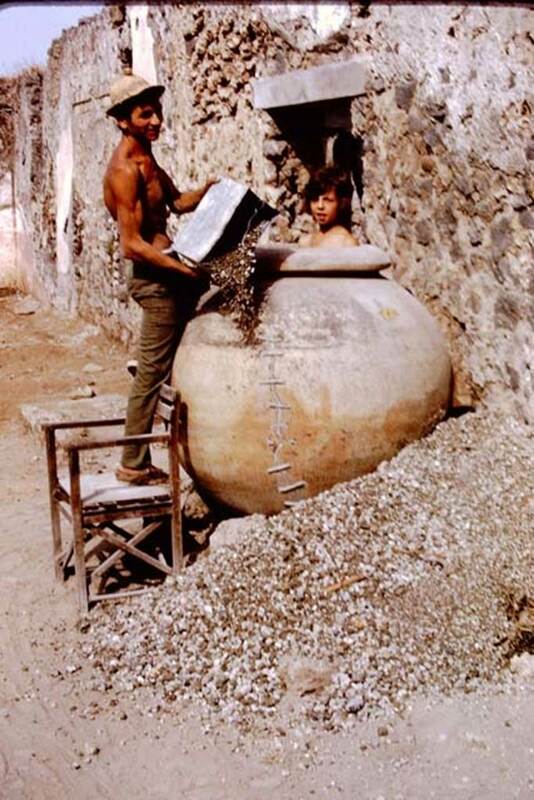 II.8.6 Pompeii, 1973. Looking north-west across site. Photo by Stanley A. Jashemski. 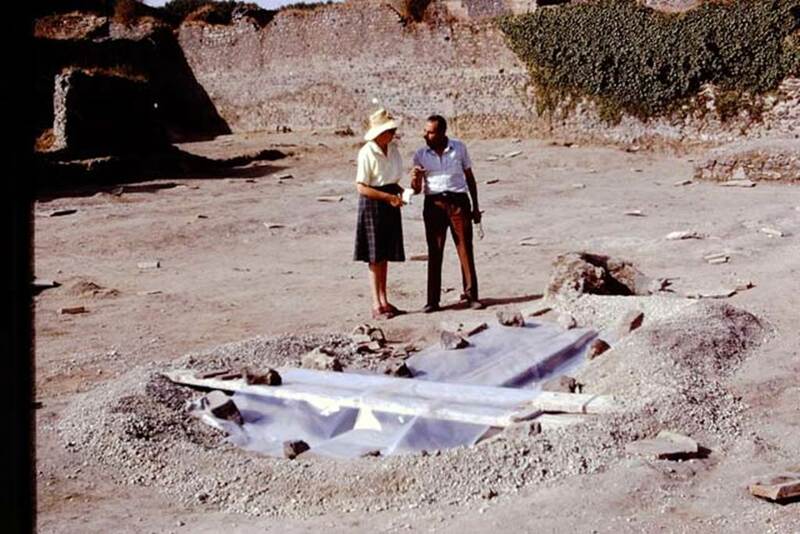 II.8.6 Pompeii, 1973. Looking south-east across protected large root cavity. Photo by Stanley A. Jashemski. 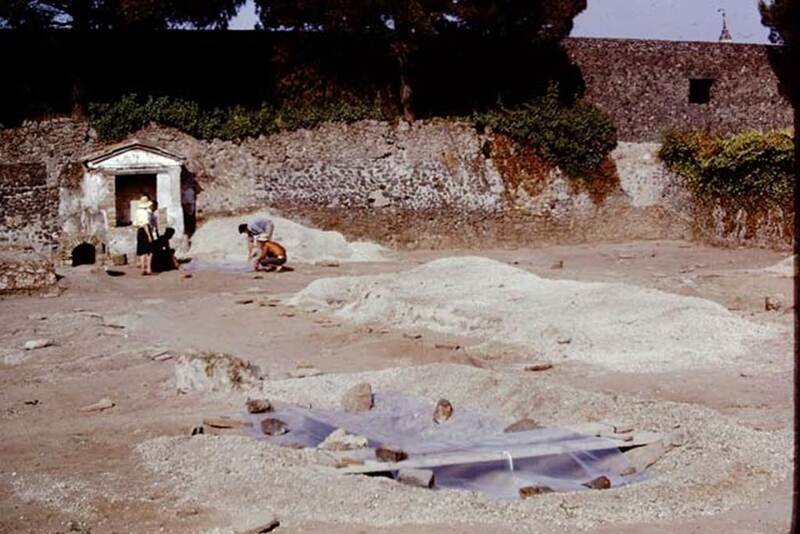 II.8.6 Pompeii, 1973. Looking north-east across site across large root cavity. Photo by Stanley A. Jashemski. 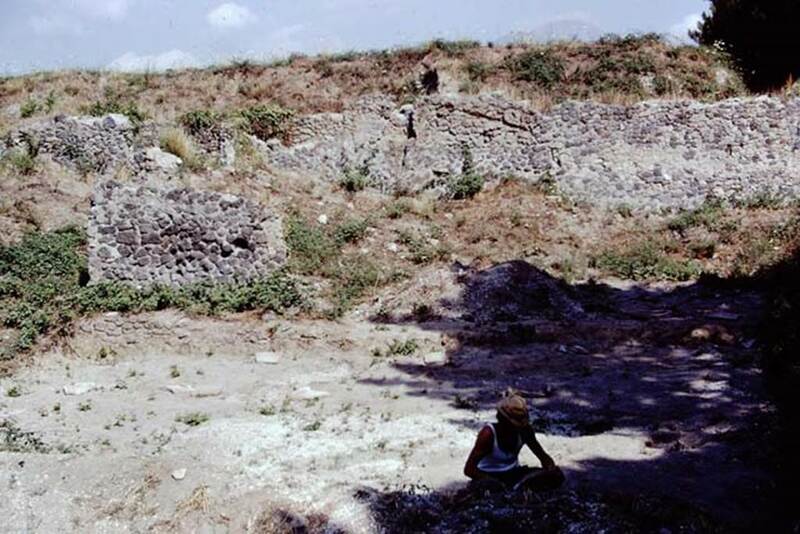 II.8.6 Pompeii, 1973. Looking east. Photo by Stanley A. Jashemski. II.8.6 Pompeii, 1973. Looking south towards triclinium and south-east corner. Photo by Stanley A. Jashemski. II.8.6 Pompeii, 1973. South end, looking south-west. Photo by Stanley A. Jashemski. II.8.6 Pompeii, 1973. Looking towards south-east corner. Photo by Stanley A. Jashemski. 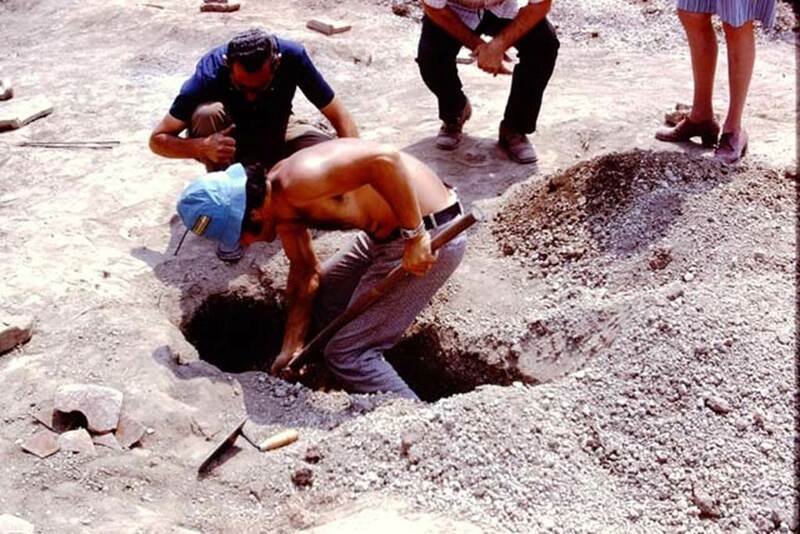 II.8.6 Pompeii, 1973. Looking towards north-west corner. Photo by Stanley A. Jashemski. II.8.6 Pompeii, 1973. Root cavities and furrows. Photo by Stanley A. Jashemski. II.8.6 Pompeii, 1973. 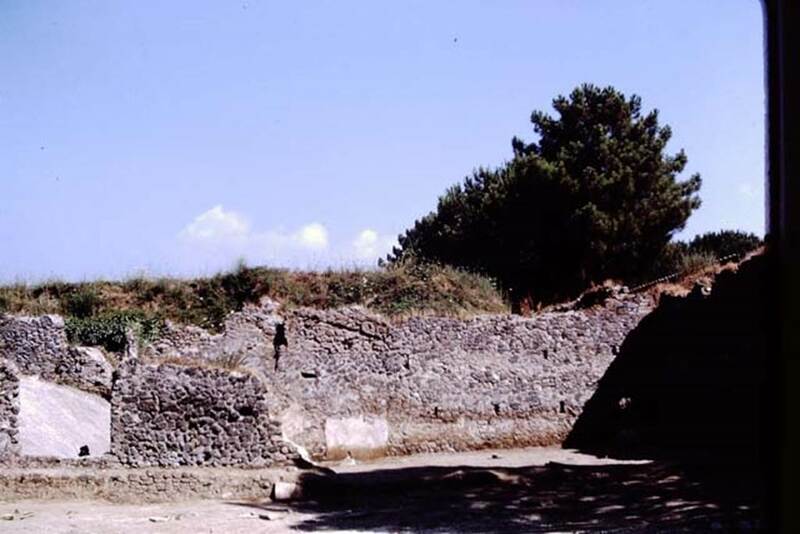 Large dolium near north wall. Photo by Stanley A. Jashemski. II.8.6 Pompeii, 1973. Finishing emptying the dolium. Photo by Stanley A. Jashemski. 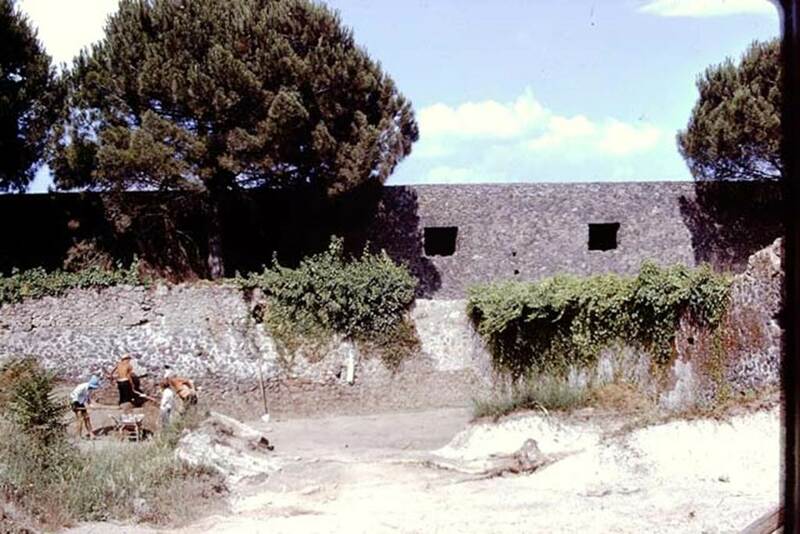 II.8.6 Pompeii, 1973. Wilhelmina with her helpers at the side of the dolium, together with the lapilli emptied out of it. II.8.6 Pompeii. 1972 photo for comparison with ones below. 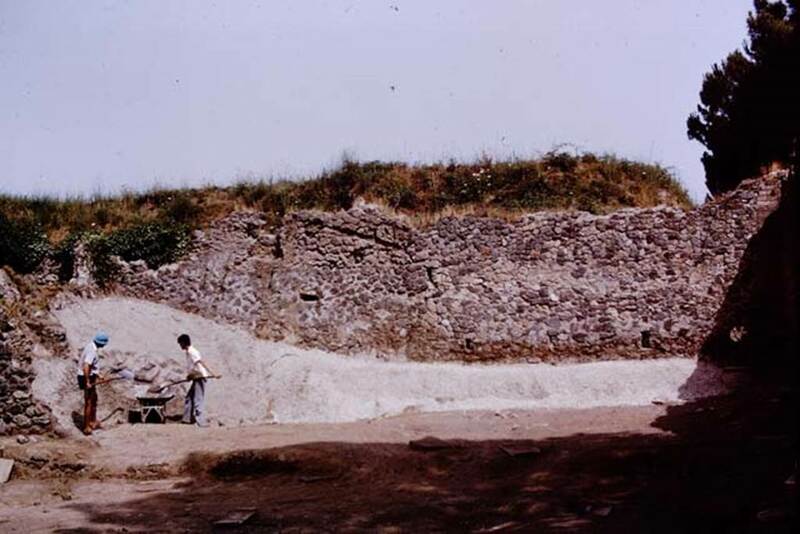 North-east corner before excavation. Photo by Stanley A. Jashemski. 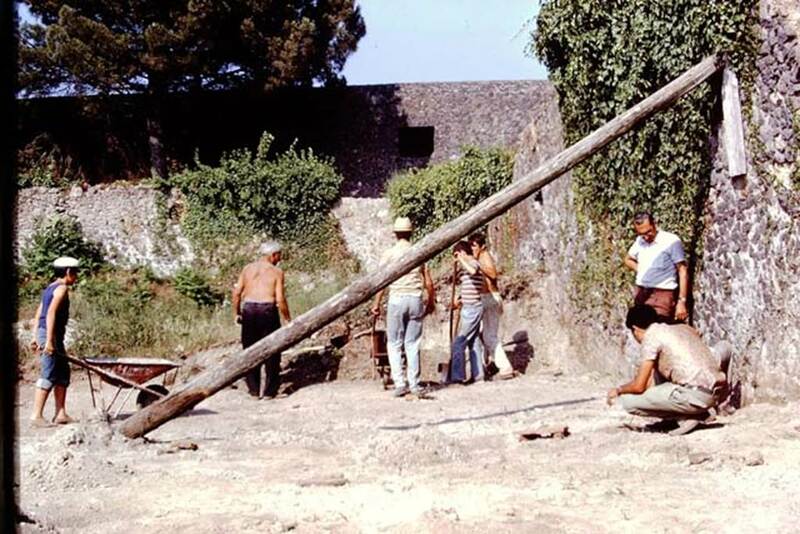 II.8.6 Pompeii, 1973. 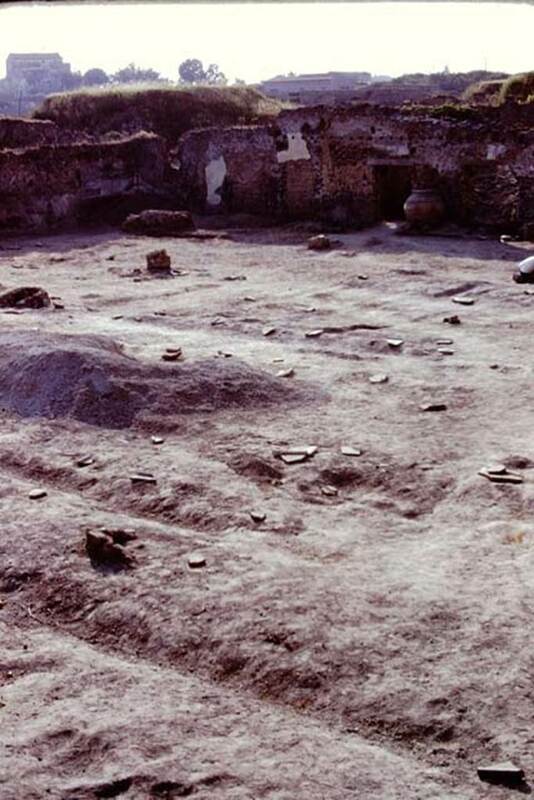 North-east corner of garden area, excavation of final amount of lapilli. Photo by Stanley A. Jashemski. 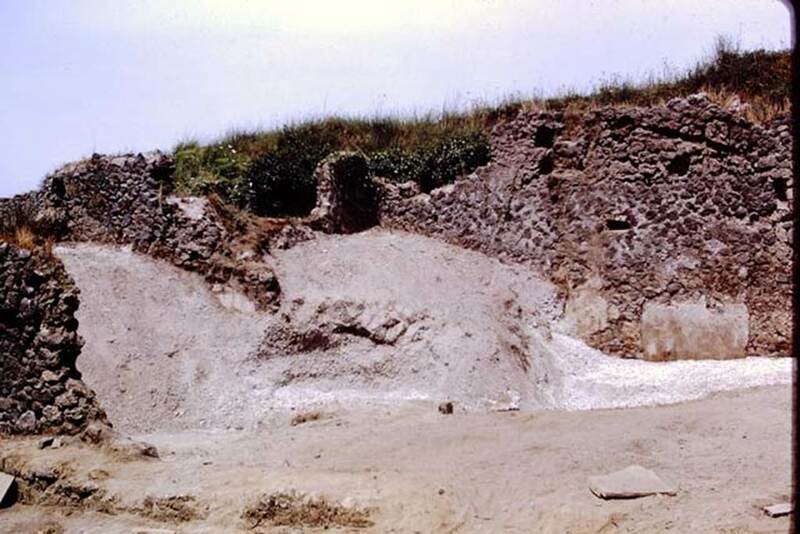 Looking north in north-east corner of garden area, the north wall has now been cleared and a buried dolium is visible, on the right. II.8.6 Pompeii, 1973. Area of restored house now, lapilli not yet cleared, looking north. Photo by Stanley A. Jashemski. II.8.6 Pompeii, 1973. Looking north in north-east corner, of house area and garden. Photo by Stanley A. Jashemski. II.8.6 Pompeii, 1973. Buried dolium in north-east corner of garden area. 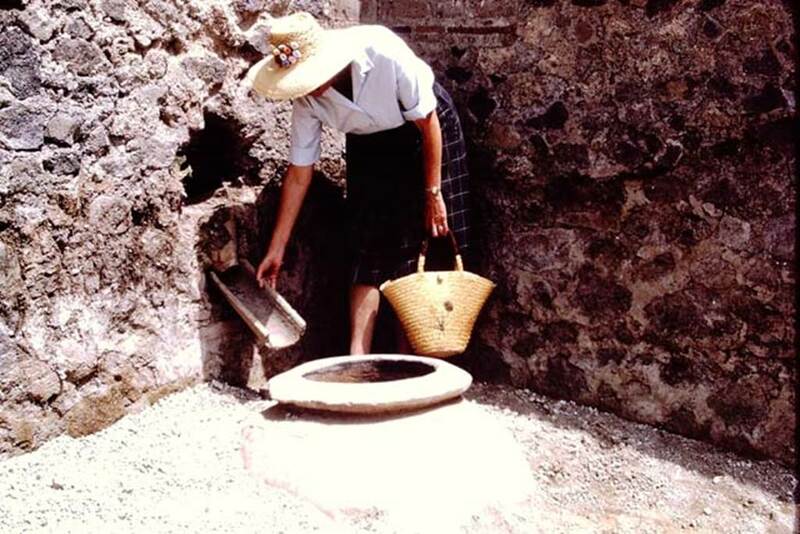 Wilhelmina demonstrating how water for irrigation would have entered the dolium. Photo by Stanley A. Jashemski. 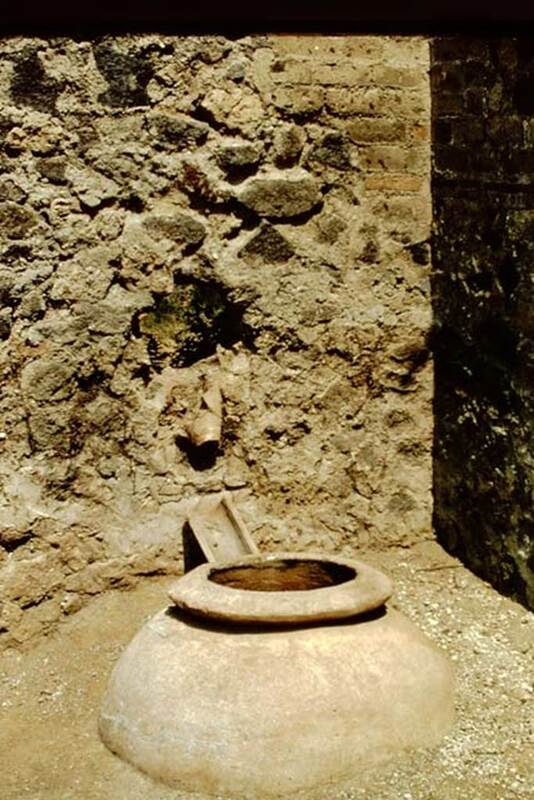 According to Wilhelmina, “Additional water, which would have had to be carried to the garden, was poured from the street side through an amphora tip (with end broken off) inserted in the east end of the north wall, which would fill the dolium embedded in the north-east corner of the garden. 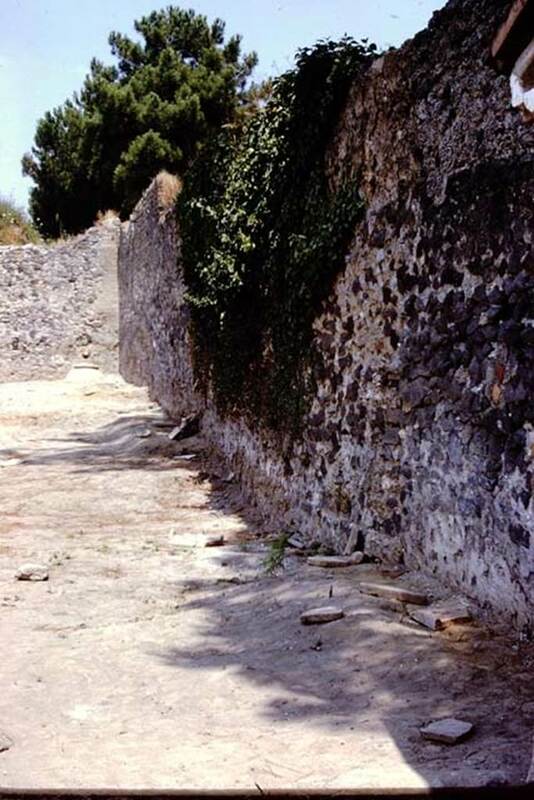 When the dolium overflowed, the water continued to flow in the channel along the east wall, and eventually along the south wall. See Jashemski, W.F., 2014. 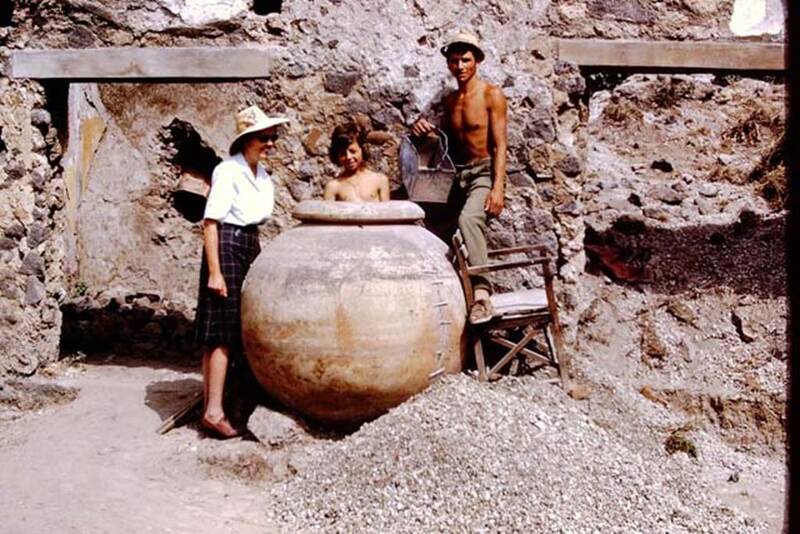 Discovering the Gardens of Pompeii: Memoirs of a Garden Archaeologist, (p.205). 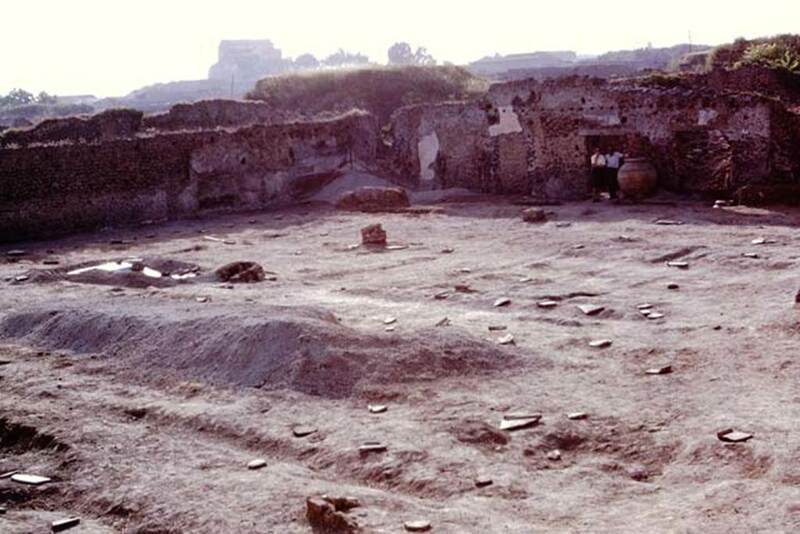 II.8.6 Pompeii, 1978. 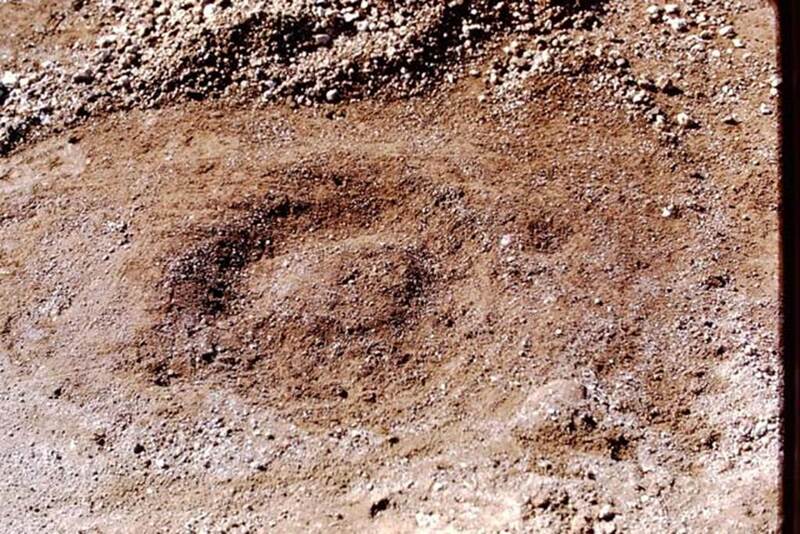 Buried dolium in north-east corner of garden area. Photo by Stanley A. Jashemski. II.8.6 Pompeii, 1973. 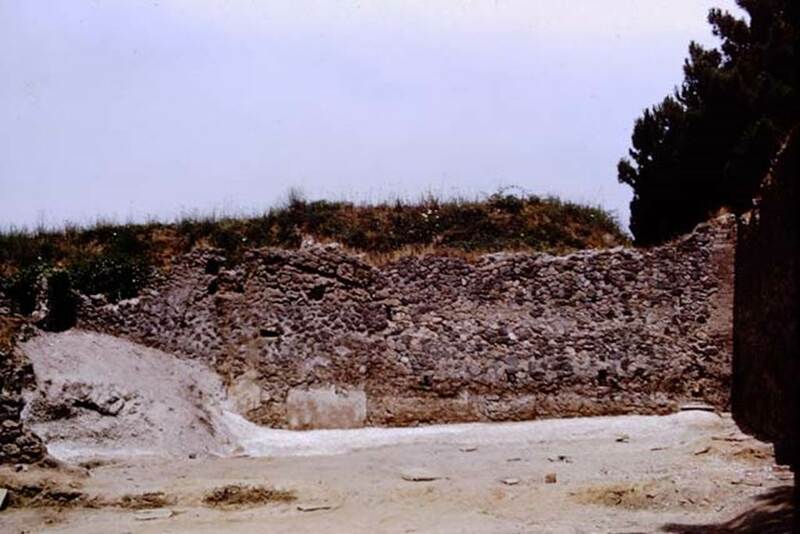 Looking north along east wall towards buried dolium. II.8.6 Pompeii, 1973. 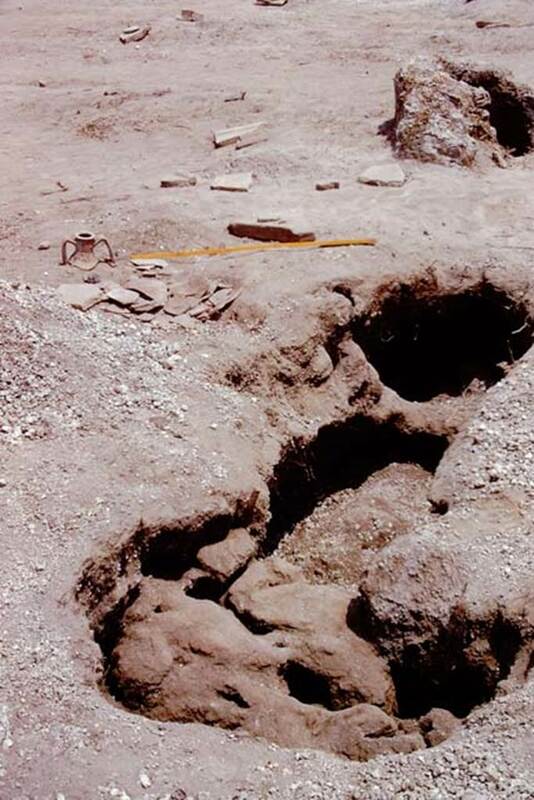 Discovery of round soil formation. Photo by Stanley A. Jashemski. II.8.6 Pompeii, 1973. Detail of round soil formation, with lapilli. Photo by Stanley A. Jashemski. II.8.6 Pompeii, 1973. 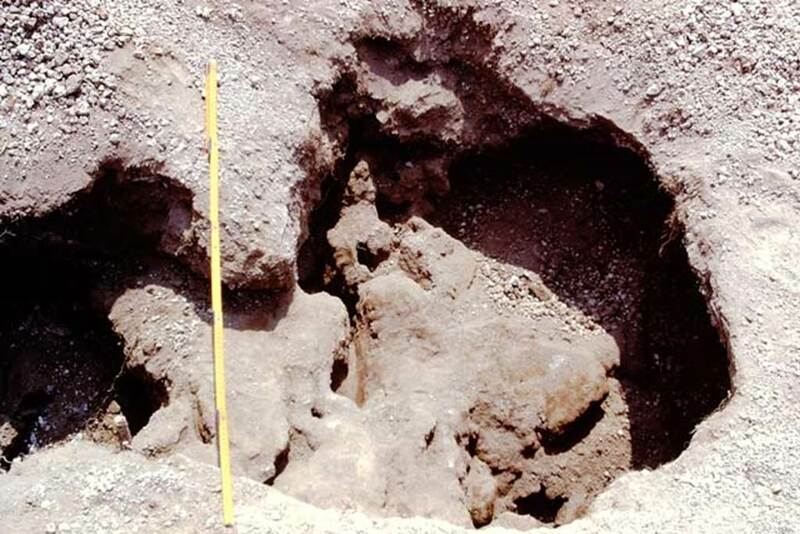 Round soil formation after the removal of lapilli. Photo by Stanley A. Jashemski. 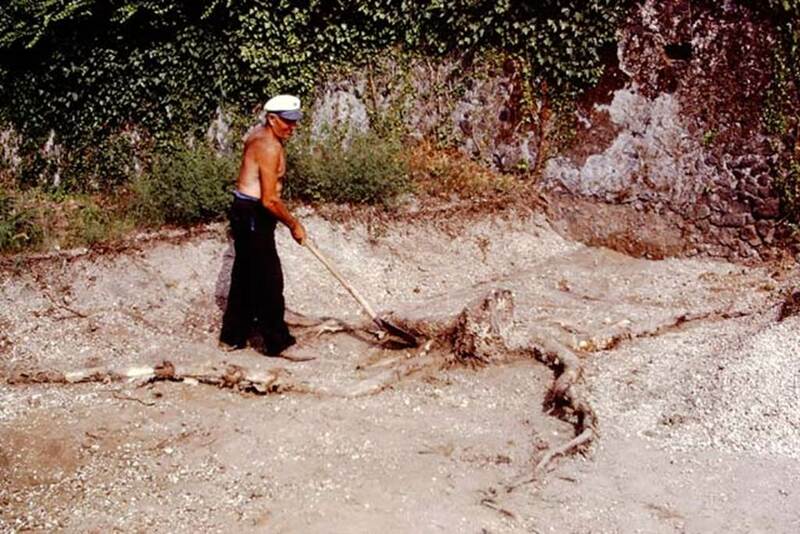 II.8.3 Pompeii, 1973. 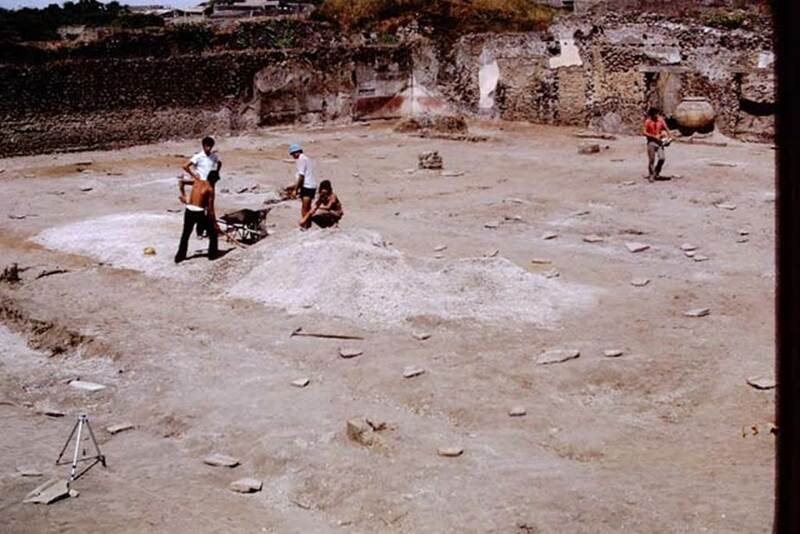 Removing the lapilli, looking across the site towards the south-west corner. Photo by Stanley A. Jashemski. 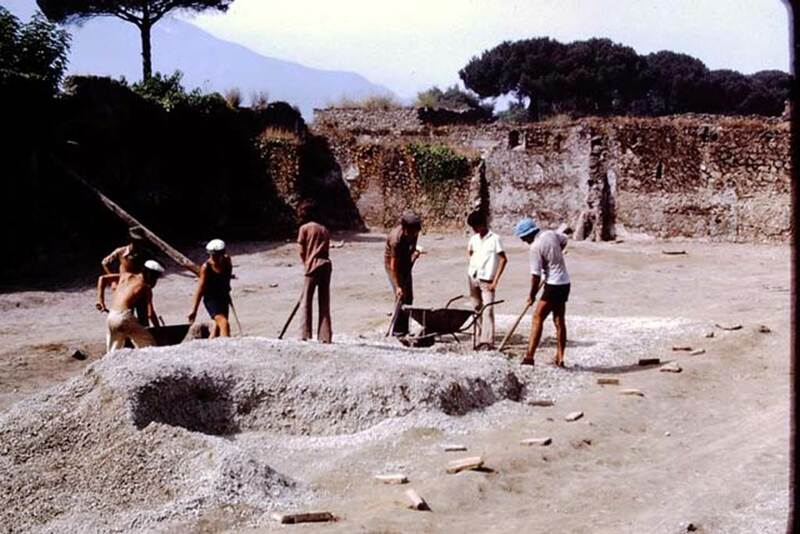 II.8.6 Pompeii, 1973. Looking across the site towards the north-west corner. Photo by Stanley A. Jashemski.